Please refer to our stock # 1677 when inquiring. 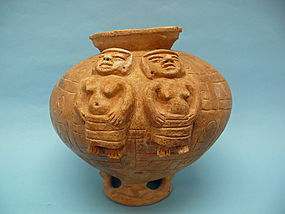 Sinu Pottery Effigy Vessel, Colombia 500 - 1000 CE. Globular form with motif of four women with bare breasts and registers of glyph like scrawls. Flared lip and footed base. Intact and in excellent condition. 10 1/2" high x 11" diameter. Ex: Milford Nemer collection, MI. According to the book Across the Pacific: From Ancient Asia to Precolombian America, By Christian Lemoy, ceramic and gold working relationships probably existed between the Sinu cultural and those of Panama and Costa Rica. The ceramics found were not as fine as those of Calima and Tumaco cultures, but they were numerous. This culture's typical pottery was painted with geometric drawings and marked incisions. Chinese pottery from Shandong dating back to 2800 BCE could have been a source of inspiration for the Sinu and generally for Pre-columbian potters.